How To Trap Snakes - People who deal with snakes on a regular basis will usually have a good understanding of these animals, and they will know that in some cases it will be better to trap and remove snakes rather than allow them to remain in a yard, garden or even inside a domestic property. Snakes are very interesting animals, and in many cases they will be drawn by the presence of a good food source such as a rat infestation. Once you have trapped the snake, it is also worth examining the area for other pest species, and dealing with them as well so that other snakes aren't attracted by the same feature. Snake traps are best set when a snake is inside a house - that's where they'll have the most success. Before setting traps, consider if the snake is perhaps harmless, and good to have around. Think about what might happen if you do trap a snake - you'll have to deal with it! Consider habitat modification, such as trimming bushes and shrubs, keeping your lawn mowed, filling in gaps under concrete, etc before trapping. Be aware that most snake traps won't catch a snake, because most snake sightings are fleeting. The important thing to remember when you are dealing with snakes is that they can bite, and even those without venom can cause a nasty injury which would require medical treatment, so be cautious around these animals. Where possible wear protective clothing over your hands and arms, and look to use tools that will allow you to keep the snake at arm's length, rather than getting too close to these creatures. If you are going to be relocating the snake, make sure you do so in a safe location and in a way that means the snake is going to be getting away from you rather than coming out of the trap towards you. Choosing the right trap for the job is an important part of catching a snake successfully, and there are several different types of trap that you can use to catch snakes successfully. 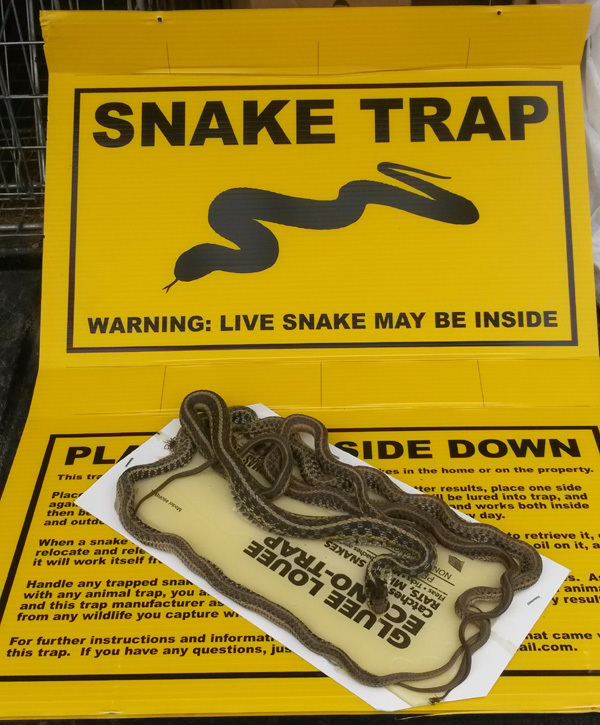 This type of trap is either a simple sheet of wood or cardboard with a an adhesive applied to it on order to stick the snake in place, or in some cases the adhesive pad will be placed inside an enclosed box to help with transporting the animal. This is actually quite an easy trap to use, and once you are happy to release the snake, all you have to do is to pour some vegetable oil on to the adhesive to release the snake. As the name suggests, this trap is most commonly used to catch small fish, but with its funnel shaped access point it makes it quite easy to use to catch snakes too. Because the funnel gets narrower as the snake goes in, it is much easier for the snake to get in than to get back out again. Many people who use this type of trap to catch snakes choose to use fresh eggs as a bait to catch the snake. These traps don't require the use of a cage or any adhesive, and are usually made from wood or a heavy duty board, and will have a wooden channel that rotates throughout the trap to guide the snake in, while being too narrow to let the snake back out again. This can be used with bait to draw the snake in, and then the lid of the trap can be removed once you are ready to release the snake. In order to select the right spot to place your trap, you need to look at the area where the snake is causing the problem, and then aim to find a spot where the snake is likely to be most active. Depending on the trap anything you can do to make the trap appear a natural part of the surroundings can help, so trying to camouflage the trap, and also trying to minimize any scent transmission from yourself to the trap can also be a good idea. There are many commercially produced substances that can be used to try and attract snakes into a trap, and these are usually designed to mimic the scent of live bait. As mentioned, snakes also like to eat eggs, so some fresh eggs in the trap can also be used as bait. Because snakes don't eat dead meat, if you are going to include another type of bait, it can be difficult to get a mouse or rat to stay in place to attract the snake, which is why this is rarely used as bait. It is important to be aware of your local regulations about whether or not you can relocate snakes, or whether you need to dispose of the animal humanely. Make sure that you are taking the snake at least ten miles away from your property or the area where it has been causing the problem, otherwise, you can be passing on the issue to someone else. Be careful when releasing the snake to make sure it doesn't leave the trap in your direction, to ensure that you are safe. Go back to the main Snake Removal page for more information about snake trapping and information about how to catch a snake in a cage trap.